Scientists have just discovered a chemical that prevents the death of brain tissue from neurodegenerative disease. The breakthrough is being called a "turning point" in the struggle to defeat a number of aged-related disorders, including Alzheimer's and Parkinson's. 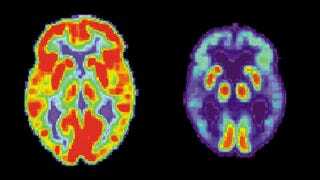 Top image: The brain at left is a normal, healthy one; the one at right belong to a person with Alzheimer's. Source: The Alzheimer’s Disease Education and Referral. Okay, before we get too excited, the new compound was only tested on mice, and it wasn't designed to work on humans (owing to differences in genetic pathways). It also wrecked their pancreas, causing severe weight loss and diabetes. But it worked. Actually, it worked really well — completely halting the brain-wasting process. Normally, mice suffering from prion disease — a condition characterized by the production of faulty, or misfolded, proteins — die within 12 weeks on account of synaptic failure and neuronal death. It's basically an Alzheimer's version for mice. But mice given the new oral treatment, a complex compound that shuts down the pathway responsible for this cognitive degeneration (an inhibitor of the protein kinase PERK), experienced neuroprotective effects — and that held true for mice treated at the preclinical stage and — importantly — after showing signs of the disease. Again, it's not a treatment for humans — but it's an important starting point. "These data suggest that PERK, and other members of this pathway, may be new therapeutic targets for developing drugs against prion disease or other neurodegenerative diseases where the [unfolded protein response] has been implicated," conclude the authors of the study. And speaking to the BBC, Professor Roger Morris from King's College London said: "This finding, I suspect, will be judged by history as a turning point in the search for medicines to control and prevent Alzheimer's disease." The next step will be for drug companies to develop a human-specific version. Oh, and one that doesn't destroy our pancreas and give us diabetes in the process. Read the entire study in Science: "Oral Treatment Targeting the Unfolded Protein Response Prevents Neurodegeneration and Clinical Disease in Prion-Infected Mice."